CBI's community minyan is the only egalitarian twice daily minyan on the West Coast of Florida. Sunday evenings at 6:00 pm, at the Toby Weinman Assisted Living Residence at Menorah Manor, 240 59th Street North, located just across the parking lot from CBI. Attend 36 non-Shabbat/Holiday minyanim over the course of the year and you will be recognized as a Minyanaire. Minyanaires are honored during our annual Minyanaires Dinner. Awards are given throughout the year including pins, books, and a special Minyanaires kippah. In our first year, over 30 members of CBI became Minyanaires, and many more have followed, but our minyan still needs you! There is a notebook in the back of the Chapel where you may sign in and be counted. 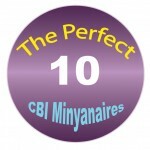 It is NOT a minyan if we don’t have 10. Come and be counted, PLEASE. Frame your day in fellowship. Be a Mensch – Make a Minyan! The Mitzvah Men’s Club provides a Continental Breakfast for all worshippers on Minyan Mornings in the alcove of the Social Hall. Please join the Minyanaires for the morning Shacharit service and relax and schmooze over breakfast bagels, cream cheese, coffee cake, and coffee and tea.